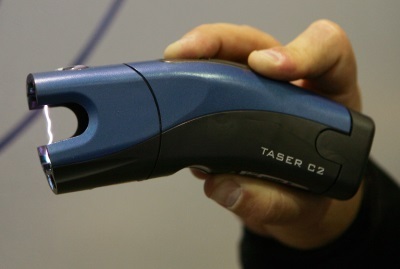 Dozens of West Island parents were shocked after learning that their teenage children were taking part in an electrifying new trend: taser parties. 43 year old critical theorist Penderwick Snoot, who studies ridiculous nonsense for a living, has been spreading the word about taser parties ever since he first discovered their existence while researching his book “I hate myself but at least I have a liberal arts degree”. “As a critical theorist, I live a parasitic existence. I am a completely, totally, and utterly useless human being that no one will ever love,” says Penderwick. “In order to cope with the fact that my liberal arts degree makes me unloveable, I spend all my free time on the internet looking for people to belittle and insult. I’ve compiled my best flamewars into a book which should be released in 2018. A morose teenager discovered my online vitriol and liked it so much, they invited me to a taser party. Like most liberal art graduates, I have very low self-esteem, so I never say no to an invitation. I’ll hang out with anybody, even 14 year olds. Anyways, the taser party was an eye opening experience." According to Penderwick, teenagers in affluent neighbourhoods have started organizing parties where they spend hours electrocuting each other. “They don’t dance, they don’t listen to music, they just shock each other,” says Penderwick. “They advertise and organize their parties exclusively via the internet. Most of these events are small gatherings of twenty to thirty privileged teenagers who are struggling with the fact that, as white people in North America, they are the living embodiment of injustice and oppression. They know, in their bones, that they all deserve to die, but they lack the intestinal fortitude to kill themselves. Instead, they just torture each other in the hopes that their acts of electric contrition will absolve themselves of the sin of having been born." Doctors have corroborated the existence of taser parties. “We have noticed a definite surge in teenage taser victims over the last year,” says Dr. Baudlebraughthaka of the Montreal Stemlord Hospital. “I guess I’m supposed to say that I hope parents will help educate their children about the dangers of playing with electricity, but at this point, screw it. Our society seems hell bent on committing suicide, so why not help push it along. If these kids want to destroy themselves, its their funeral. As a doctor, I’m sick of these idiots wasting my time. If you’re dumb enough to electrocute yourself on purpose, you don’t deserve to live." Penderwick agrees. “I look forward to a world where everyone hates society as much as I do,” says Penderwick. “The idea of living in a world where everyone hates everybody and we all want to die? That makes me happy."